To the Oriental physician, smooth and unobstructed movement of Chi and Blood are the basics of good mobility. OHCO-Motion works on this relationship, moisturizing and lubricating at a deep level. This balanced blend of 19 herbs can ease discomfort, provide muscle and joint support, and restore locomotion. Overexertion and physical trauma often result in stagnation of Chi and Blood Xue (pronounced sh-way). Blood Xue refers to the substance that flows through acupuncture meridians; while Chi is the force that causes it to flow. To the Oriental physician, smooth and unobstructed movement of these invisible channels of energy is life and health. An elegant relationship between Chi and Blood Xue is required to maintain this movement. 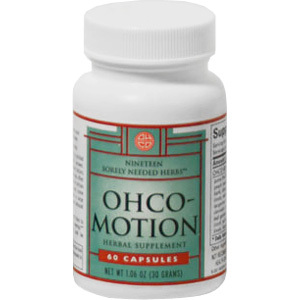 Because OHCO-Motion works on this relationship, it nourishes the circulatory system on a functional level rather than simply masking pain symptoms. Stagnation of Chi and Blood Xue results in muscle aches and joint pains that are associated with most rheumatic conditions. 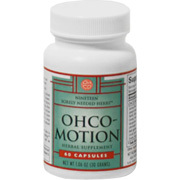 OHCO-Motion is a synergistically balanced Chinese herbal formula that can ease discomfort and restore locomotion. Please ask for more literature on OHCO's unique products. Take two capsules of OHCO-Motion three times a day. Throw out the notion that a printed set of directions will provide the exact answer. Consider size, constitution, timing, and the seriousness of the forces invading each unique person. Initially, take OHCO-Motion as needed along with basic first aid measures (Rest, Ice, Compression, and Elevation). Frequent use of OHCO-Motion (as often as every twenty minutes) may be required to change the momentum of an invasion. If there is no change or symptoms increase, see your health care provider who can identify structural problems and help evaluate your condition. OHCO-Motion will complement and be complemented by hands-on bodywork. OHCO-Motion is not recommended during pregnancy.